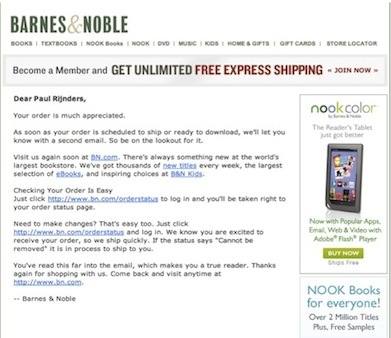 Or I hate you, Barnes & Noble, for cancelling my order. But your emails sure look awesome! Okay, I admit it. 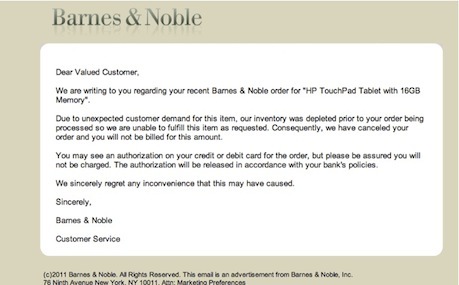 I was one of those blind & hungry piranha-like consumers that swam the merchant rivers trying to get my bite of that fire-sale-priced, recently discontinued tablet called the HP Touchpad. What? You don’t know what I’m talking about? You mean you didn’t line up 50 people deep at 9 AM at your local Best Buy because you’d heard that HP’s answer to the iPad was marked down from about five hundred bucks down to less than a Benjamin? Never mind that I’m supposedly an Apple fan boy, and that the Touchpad was being abandoned by its maker just a few months after launching. If it was good enough for the thousands of fellow bargain hunters of slickdeals.com and fatwallet.com, then it was good enough for me. Yay! There it is! Now it’s going to ship. Wow, when it gets here, I’m going to put on my Silly Bandz and surf the web for more crazy stuff. Oooh, that’s a great looking email, by the way. Of course, any email would have looked good at that moment. But this really was nice email marketing. This is how you do it. Capitalize on the good news with some other offers. People are feeling giddy right now. 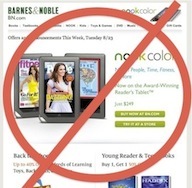 They just might splurge on a Nook for their spouse. Sorry, We Messed Up. No Tablet for You. So the next day I wake up to an email that informs me that I’m not getting the Touchpad. Looks like the demand was higher and faster than their inventory system. Bummer. But at least this email looks good too. I love that it wasn’t clinically white and plain. Maybe bad news goes well with beige. Really, if you’re going to send a cancellation email, I honestly think this is the right way to do it. Now, I don’t care how good looking this email is. It’s too soon, much too soon. I’m still reeling from my shopping loss and this is like rubbing salt in my superficial wounds or trampling on my much too entitled soul. I have a new rule: If you can’t fill my order, you also don’t get to keep my email subscription. In fact, take me off yourself. Otherwise it all seems like a big bait & switch. I know it definitely wasn’t, but some other people don’t. 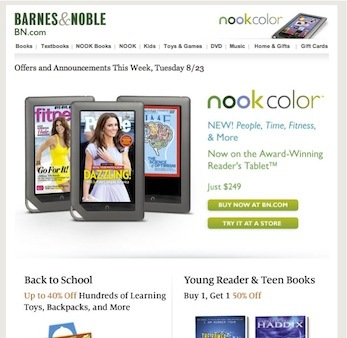 Handle it, B&N. I’m too grumpy to think rationally. I'd like to add that I'm not stopping my monthly stop in at Barnes & Noble. I really love their store and would be heart broken if they wouldn't let me in!!! !